Figure 5-21.-Fuel intake flow diagram. 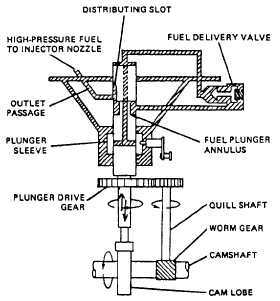 Home > Construction Training Manuals > Construction Mechanic Advanced > Figure 5-21.-Fuel Intake Flow Diagram. Figure 5-20.-Fuel supply pump assembly-sectional view. Figure 5-22. - Beginning of fuel delivery flow diagram. 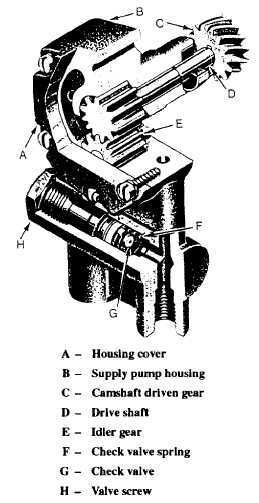 displacement fuel supply pump (fig. 5-20) is gear driven by the pump camshaft through an engine camshaft gear and provides fuel to the hydraulic head for injection and cooling. Figure 5-21 shows fuel intake at the hydraulic head. Injection (fig. 5-22) begins when fuel flows around the fuel plunger annulus (fig. 5-23) through the open distributing slot to the injection nozzle. 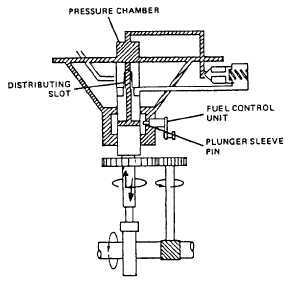 A continued upward movement of the fuel plunger causes the spill passage to pass through the plunger sleeve (fig. 5-24). This reduces pressure, allowing the fuel delivery valve to close, ending injection. 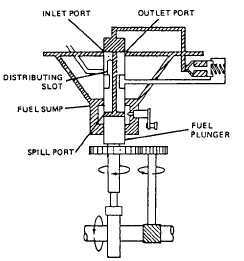 This is accomplished through a single plunger, multioutlet hydraulic head assembly (fig. 5-19). Figure 5-23.-Fuel delivery flow diagram.